The dog days of summer are here, so shouldn’t astronauts hurtling through space get to enjoy some Earthly delights? Today, a SpaceX Falcon 9 rocket will launch some experiments—and lots of ice cream—up to astronauts aboard the International Space Station (ISS). Honestly, the flavor selection is not too shabby. Today’s delivery of tasty treats should not be confused with The Cosmic Ray Energetics and Mass (CREAM) experiment—or ISS CREAM—an iteration of which will also be ferried up into Low Earth Orbit today. ISS CREAM is kind of like a balloon that measures cosmic rays in space, far above the interference of Earth’s atmosphere. Its cute name might also have something to do with today’s special delivery, of actual ice cream. SpaceX’s ice cream run—whose launch window opens at 12:31 p.m. ET (1631 GMT) from Kennedy Space Center in Florida—will include roughly 6,400 lb. (2,900 kg) of science experiments and supplies packed into a Dragon spacecraft. This includes 20 mice, which will be used to study the impacts of long duration spaceflight on biology. 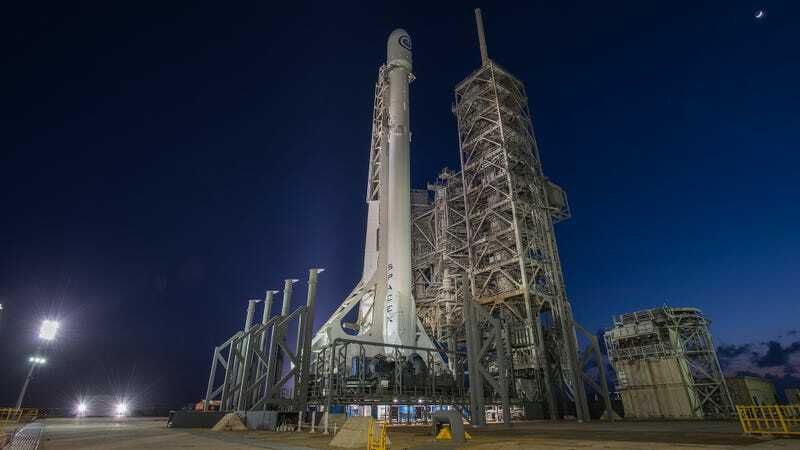 It’s the rocket company’s 12th contracted resupply run to the ISS, and between ice cream, mice, and an attempted re-landing of the Falcon 9 rocket’s first stage booster, it should be one hell of a launch.